Published: Nov. 6, 2015 at 12:05 p.m. Updated: Nov. 6, 2015 at 06:17 p.m. The ninth week of the season is upon us. Between injuries and bye weeks, fantasy fans are likely dealing with a number of crises in trying to set their lineups. While we can't solve every single conundrum, we can do our best to give you some guidance. The Fantasy Stock Watch is again up and running to help you figure out some of the moves you need to make. The injury bug has reared its ugly head far too many times this season and last week it took Le'Veon Bell with it. That puts Williams back in the spotlight. 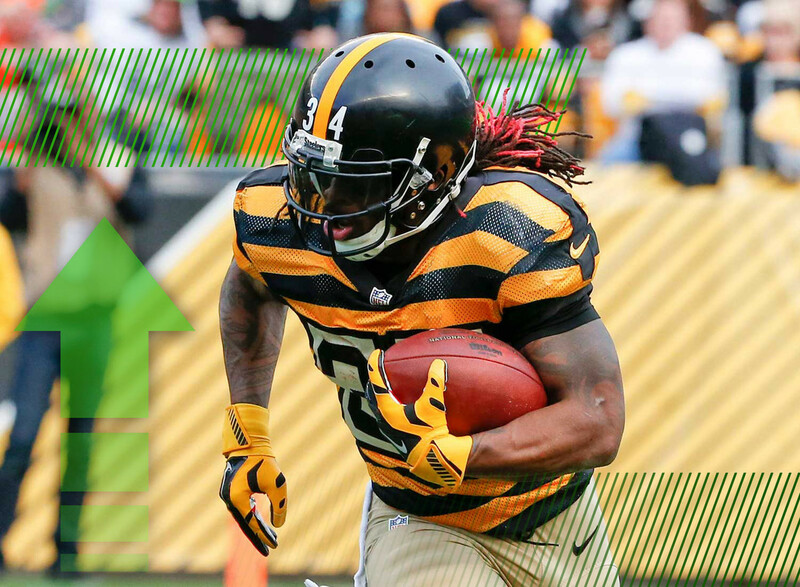 The veteran was the top rusher in the league after the first two weeks while playing in place of the suspended Bell. Williams is the best of the backup running backs in the league and should not only be universally rostered in fantasy football but should be started just about every week. Remember at the start of the season when some were arguing that Luck could be the top signal-caller in fantasy football? That seems like an awfully long time ago. Luck has been the picture of inconsistency all season long and this week's game against the ferocious Broncos defense should have fantasy enthusiasts extremely concerned. Whether the issue is a lingering injury or just an on-field regression, Luck just hasn't delivered this year. Once again, injury puts a young player in the spotlight. With Matt Forte (knee) out of action for at least the next couple of weeks, Langford steps in to carry the load for the Bears. This week's contest against the Chargers is one that fantasy managers will want to take advantage of. No defense has been worse against opposing running backs. The rookie should be able to post nice numbers even with a limited workload. The Chargers are dealing with their own injury issues. Keenan Allen's season is over with a lacerated kidney. That will leave it to the receiving duo of Steve Johnson and Malcom Floyd to pick up the slack. Johnson was an early-season sleeper and does many of the same things that Allen offered. Meanwhile, Floyd is a big play specialist who doesn't always need a lot of targets to put up solid fantasy production. Considering how much San Diego is throwing the football, both are worth having on your fantasy team. Cobb has not been the fantasy playmaker that many expected when they selected him in the early rounds of their fantasy draft. Perhaps the loss of Jordy Nelson has focused too much defensive attention on him. Or maybe the lack of a consistent running game has somewhat stifled Green Bay's high-powered passing attack. Either way, Cobb is barely a top 30 wide receiver and could find himself locked up with Panthers shutdown corner Josh Norman this weekend. That's no bueno. With such an atrocious season underway (six TDs, five INTs), Kaepernick already had minimal fantasy value. That falls to zero upon the news that he's being benched in favor of Blaine Gabbert. We can sit here all day and argue who's to blame for the Niners offensive struggles, but the fact remains that you don't want any of them in your fantasy lineup. Here's the weird part: normally the player who is elevated to a starting role gets a bump in value. But who (besides Jim Tomsula) is really starting Blaine Gabbert? So far this season, you'd be better off consulting a Magic 8-Ball when trying to figure out which Titans running back to start. But things might have gotten a little easier with interim head coach Mike Mularkey calling Antonio Andrews the team's "workhorse" and talked that Andrews is going to be the team's starter for the rest of the season. There are still offensive issues to work out in Tennessee, but if Andrews is getting the bulk of the running back opportunities, that's a good place to start. Once upon a time, Ellington was pegged as Arizona's workhorse running back. Then Chris Johnson happened. Now Ellington is being relegated to five or fewer rushing attempts per game. That's not going to get it done. If you spent a draft pick (or waiver claim) on the rusher, you're hoping that Bruce Arians goes to a committee system. But Bruce Arians doesn't do running back committees. And don't ask him about your fantasy team. It won't end well. When Jimmy Graham was traded to Seattle, many people believed that the door was opened for Josh Hill to become the Saints new productive tight end. Turns out we were looking in the wrong place. Over the past several weeks, the veteran Watson has become one of Drew Brees' favorite targets. While he's not going to be confused for Graham, he's become worth adding at a very thin position. We tried to make Theo Riddick a thing. But the Lions offense was opposed to Theo Riddick being a thing. So for the moment, Theo Riddick isn't a thing. With the Lions front office undergoing a major overhaul and head coach Jim Caldwell planted firmly on the hot seat, we'll see if Theo Riddick becomes a thing going forward.